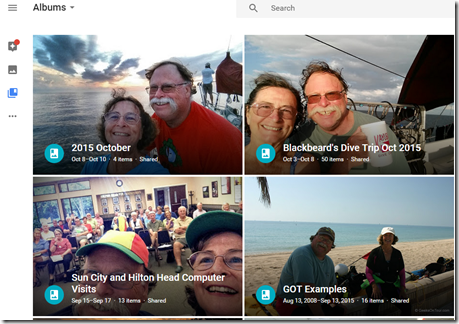 #ilovegooglephotos – Learn Picasa and Google Photos! I love Google Photos! I take most of my pictures with my Android phone and Google Photos automatically copies them all to my online Google account. If I ever had to answer a question like, “Where were you on the evening of August 2?” I could find the answer by looking at my pictures! It works the same on a computer browser, or your Android or Apple mobile device, you first select one or more photos. Next you tap the + icon at the upper right and choose Create New->Album. Type a name in the place of Untitled, and tap Done. When you first create an album, it is still for your eyes only. Once it is created, you can use the share icon ( ) to send a link to Facebook, Google+, or just copy the link to send via email. But the album is still not public – it is only visible to those with the link. It is not discoverable by browsing the web. Select one or more pictures from your library and click that + icon. You should see the option to “Add to Album.” Simply click (or tap) on the name of the desired album, and you’re done. 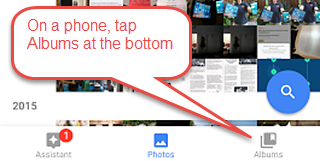 How do Google Photos Albums relate to Picasa Web Albums? The albums that you create are one and the same. You can still use the Picasa Web Albums interface (until May 1, 2016) by browsing to www.picasaweb.google.com and you will see any albums you have created using Google Photos. 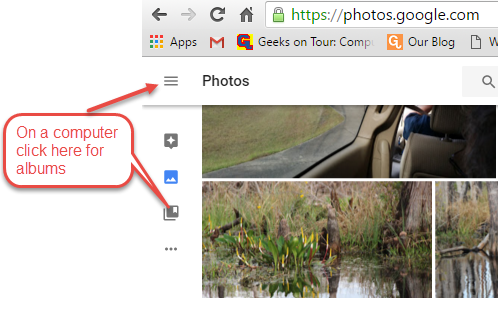 And, while using Google Photos, you will see any albums you created using Picasa. They are simply two interfaces to the same sets of pictures. There are still several features available thru the Picasa Web Albums interface that are not (yet) available using Google Photos. One Picasa Web Albums feature that I still like to use is the ability to make an album Public: Actions->Album Properties->Visibility->Public on Web. This way, I can give one link to all my public web albums, like this: https://picasaweb.google.com/chrisguld. Another one is the ability to order prints. Just select one or more pictures then click the menu for Prints, and Order Prints. You should now see a link to your cart where you can specify what service you want to use to get your prints.